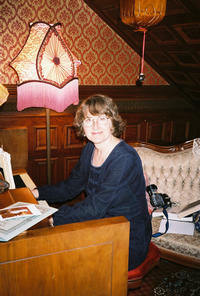 Anne Rothfarb, a carilloneur and UC employee who died in June. Photo credit to Joanne Pease-Simpson. RIVERSIDE, Calif. (www.ucr.edu) — The Friends of the Carillon hosted the second annual dinner fundraiser at the University of California, Riverside Monday, Sept. 19, and were rewarded with $4,615 in donations, along with a light show courtesy of Mother Nature. "I haven't seen a display of lightning like that in Southern California for quite a long time," said Michael Jenkins, a UCR staff member and a member of the Friends of the Carillon, about the tropical storm Monday night so visible to the 40 people attending the outdoor benefit. "Perhaps it was a special gift to lock the events in the minds of those present... the rainbow, the beautiful sunset, the lightning, the smells, the cool of the drizzle and night air, the good food and drink, the nearness of friends gathered for a special cause, the sharing of stories, the laughter, the bells..."
He said the money raised will cover the maintenance needed on the carillon every two years. Already the group is planning for next year's event, which will be the carillon's 40th anniversary. The concert was free, and those who wanted dinner paid $20. Donations above that amount went to the carillon fund to cover expenses. The university covers the salary of carillonneur, David Christensen. “We named this concert for Anne Rothfarb because she loved the carillon and worked so hard to raise needed maintenance funds last year,” said Jenkins. “Anne was also an accomplished carillonneur studying under our own David Christensen, and they played a duet concert last year that was beautiful.” She died earlier this year, after the discovery of a brain tumor. Last year’s event, organized by Rothfarb, brought in $5,000 for the cause. Since 1966, the tower has stood at the center of campus. In 1964, Professor of Music William H. Reynolds toured existing carillons around the world and chose the Paccard Foundry of France to cast the bells. The 48 bells in the UC Riverside bell tower are considered some of the finest in the world. The largest bell weighs over two and one half tons. All the bells are played from a large keyboard of wooden batons in a room atop the tower. The tower and bells were the donation of Philip and Dorothy Boyd, long-time University supporters, and were dedicated in 1966. It is currently one of only five true carillons in California.